Strange but true: The scientific name for tomato is Lycopersicon lycopersicum, which means “wolf peach.” But if you’re like most Americans, this odd name won’t scare you away from enjoying tomatoes. The average American eats some 23 pounds of tomatoes every year. Half of those tomatoes come in the form of ketchup! 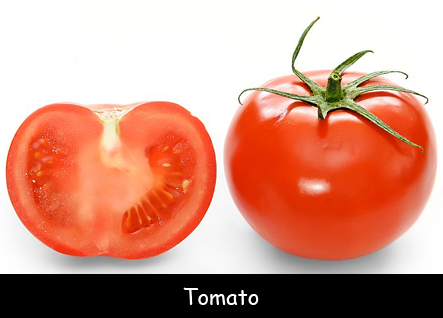 Tomatoes are native to South America. Spanish explorers introduced them to Europe. Europeans thought tomatoes were poisonous and even called them ‘poison apples.’ Turns out it wasn’t the tomatoes that were making people sick, but the pewter plates they were served on. The acid in the tomatoes leached lead out of the plates, causing lead poisoning. China grows more tomatoes than any other country in the world. Most of the tomatoes grown here are processed into paste or canned tomatoes. The U.S. is second to China. California and Florida grow most commercial tomatoes here. Tomato juice is Ohio’s state drink. In cold climates, tomato plants in a garden die when the frost comes; in warm places, tomatoes can grow year-round. A huge tomato plant grows at Disney World and sprawls over an area larger than an Olympic-size swimming pool! Tomatoes come in over 10,000 varieties, including grape tomatoes, which can be eaten in one bite, and huge beefeater tomatoes that are as large as a dinner plate. Tomatoes aren’t just red. They can be orange, yellow, green, striped, purple, or even white. At the Heinz Ketchup factory, factory workers test the ketchup to make sure it’s extra thick. Runny ketchup is thrown out. In Spain, people throw over 150,000 tomatoes at each other during Le Tomatina, an annual festival. Answer: Tomato is technically a fruit, which might explain why it’s loaded with vitamin C. It’s also a good source of antioxidants. Visit Study.com for a video on tomatoes.